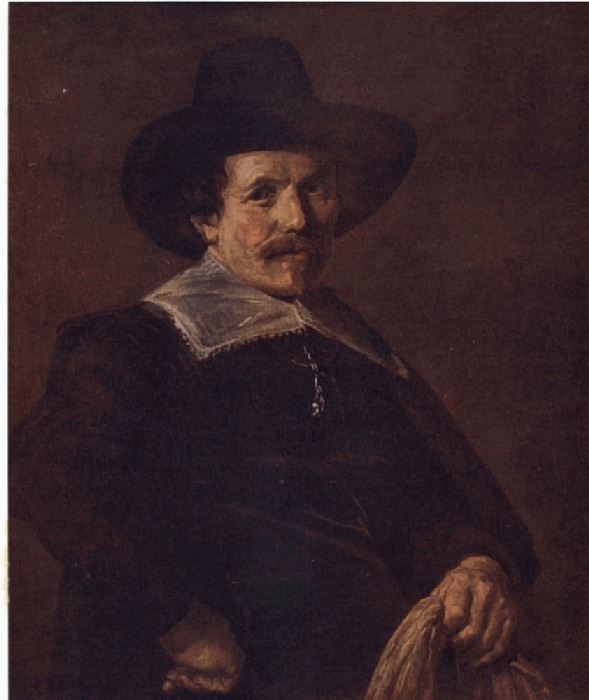 Although Frans Hals was the founder of the Dutch school of genre painting, and takes rank with the world's greatest painters, it is only within comparatively recent years that his fame has been rescued from long neglect. Today his masterly delineations of expression and character are placed among the most popular pictures of the world. The "Man with a Glove" is not so well known as some of his other work, because it only came into the possession of the British nation in 1910, on the death of Mr. George Salting, who owned it. In all respects it is in the best style of Hals. It is one of his favourite small canvases, showing a half-length figure. You see a strong, rugged face (the flesh tints superbly painted) beneath a large black hat, set against a sombre background. The man wears a black cloak, relieved by a white collar. In his left hand he holds a glove, while his right rests upon his hip. With Frans Hals character and expression dominated the material things of the world, and he concentrated his mind upon the face of his subject as being the centre of intelligence, and then upon his hands as being interpreters of character also. His treatment of clothing and of background is such as will best throw these features into prominence. His individual style is revealed in the manner by which he focuses attention upon the face and hands, not by extravagant contrasts of light and shade, but by supreme skill in regulating his gradations of light. It is to be noted that the costume of the period was very difficult to paint satisfactorily, and the genius of the painter is well shown by his treatment of the clothing in this picture.